Redlands Auto Plaza General Manager Loren Campbell eventually wants service advisers to cashier 80 percent of the dealership's repair orders. "You shouldn't have the customer walking up to the cashier saying, 'What is this charge?' and then having the cashier trying to find the service adviser." LOS ANGELES -- Bottlenecks in the service drive are the bugbear of every car dealership. But Loren Campbell, general manager of Redlands Auto Plaza 60 miles east of downtown Los Angeles, believes he has a fix. Service advisers work in teams of two, so if one is busy, the other is ready to help a waiting customer. Service advisers are being trained to work as cashiers, so they can handle service from start to finish. One of the cashiers is now the service department receptionist, with access to all the service repair invoices, so that she can answer customer phone-in questions without having to page a service adviser. "You shouldn't have the customer walking up to the cashier saying, 'What is this charge?' and then having the cashier trying to find the service adviser," Campbell said. "The cashier's window is not the right place to be explaining things." The service adviser duos have dedicated teams of mechanics for more orderly work flow. "Some things are so specialized that only one technician can handle it. But most of the 12 techs, including the lube techs, they can pretty much handle everything," the 57-year-old Campbell said. Not that there haven't been hiccups. At one point, the service advisers were cashiering as many as 40 percent of completed repair orders. But launching too many new processes at once was challenging, so now the advisers are temporarily cashiering just one in 10. It didn't help that a service adviser quit, and a new trainee was just learning the job. But eventually, Campbell wants service advisers to cashier 80 percent of repair orders. Also, customers late for appointments gum up the works, especially if there are walk-ins. "The customer is expected to be here on time, because if they are late they intrude on someone else's time," Campbell said. "We set appointments every 10 minutes. We don't want two appointments showing up at 8:20. We don't want eight customers showing up for four advisers." Campbell got hooked on the car business as a part-time car washer to pay for his pre-med degree while attending college in Indianapolis. The dealer, Bob Baker, saw Campbell's potential, and rapidly moved him up the company ladder. The two ended up working together for 34 years before Campbell ventured out on his own. At the Redlands store, the configuration of the old dealership was a problem -- which is being solved with a store redesign. There were three service lanes, with two going in and one going out, which caused chaos. The new layout will have a predictable all-lanes-in flow from the main street and an exit out the back. The remodel also will have an electronic appointment board that shows which advisers are handling which jobs. "The customer can see the board. It will build credibility," said Campbell, who followed Baker from Indiana to San Diego and partnered with him in a Chevrolet-Subaru store in 1989. 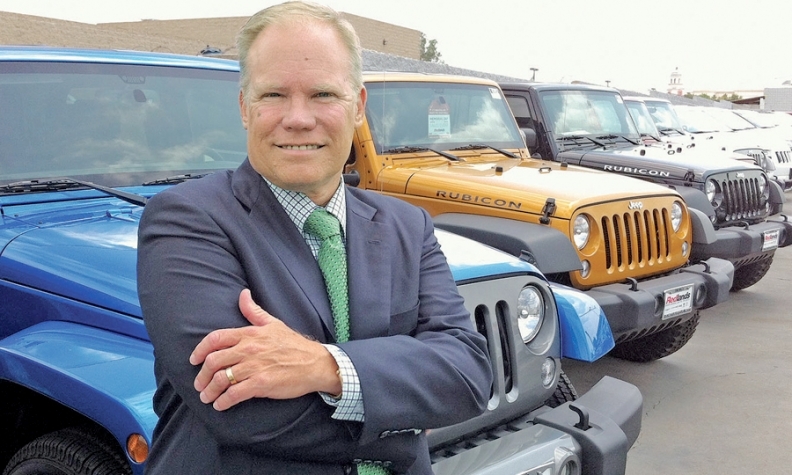 A couple of other deals with Baker later, Campbell became a minority partner in the Redlands store with Tom Bell, buying the dealership from second-generation owner J.P. O'Donoghue. The dealership now sells 125 new and 75 used vehicles a month. The changes in the service drive appear to be paying off: Despite the lack of a body shop, service absorption has risen from 56 to 74 percent, although Campbell said, "We're still not where we want to be. We want to be at 90 percent." Service absorption at 100 percent means a dealership's fixed expenses are matched by gross profits from service and parts. "Time is the only thing we have to sell," Campbell said. "The process is the key: quicker and simpler. That's what customers want."